Hidden below one of the most admired attractions in Paris is the Archaeological Crypt of Notre Dame Cathedral and a 262-foot (80-m) descent into the history of Paris' city center. The result of more than a hundred years of excavations, the crypt reveals the city's architectural layers, including ancient ruins from the Gallo-Roman town of Lutetia—the predecessor of present-day Paris. Follow one of two itineraries through the ruins to see 3rd-century homes, a 4th-century bathhouse, and the ancient port on the River Seine. 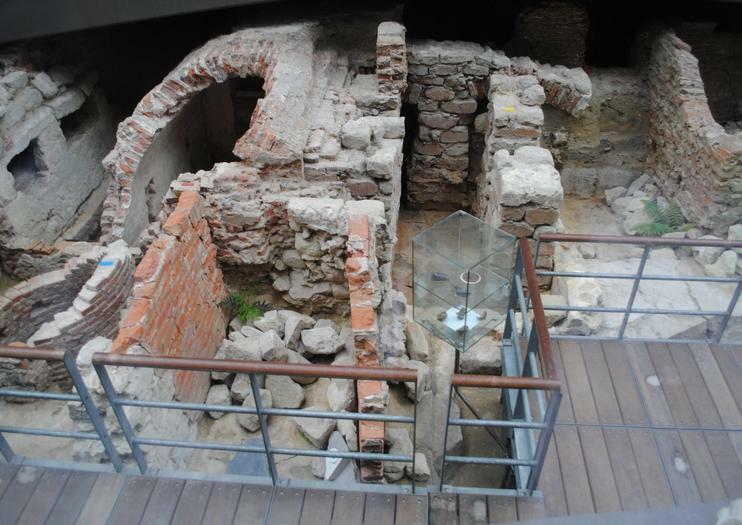 Also inside the crypt are the remains of a two-story, 12th-century home, an 18th-century hospital, and shops built along the rue Neuve Notre Dame in the second half of the 12th century. Multimedia exhibits inside the crypt guide visitors through centuries of historical development in Paris, making it a must-see for archaeology- and history-buffs. The crypt also contains an exhibit on the construction of Notre Dame Cathedral, and can be visited free of charge with the Paris Museum Pass. The crypt is located under the square in front of the Cathedral of Notre Dame, and is accessible by metro, train, and bus. Take metro line 4 to the Cite ou Saint-Michel stop, the RER train to the Saint-Michel Notre-Dame stop, or buses 21, 24, 27, 38, 47, 85, or 96. Audio guides in English, Spanish, and French are available for 5 euro. The crypt can be visited in 30-45 minutes. There are no toilets or coat-checks inside the crypt. The crypt is open Tuesday to Sunday from 10am to 6pm, with the last admission at 5:30pm. Admission costs 8 euros, but is free to visitors holding the Paris Museum Pass. Get a closer look at Notre Dame Cathedral and its surrounding neighborhood on a 2-hour self-guided audio tour. Begin at a time that pleases you and explore at your own pace, as you listen to narration by French celebrity Lorànt Deutsch. Hear the secret history behind the UNESCO listed cathedral’s smallest details. The entertaining tour goes far beyond what you find in a traditional guidebook and most large group tours.